Having already presented an outstanding line-up of new watches earlier this year – headed up by the exceptional Master Ultra Thin Minute Repeater – you might have thought Jaeger-LeCoultre would take some time off to bask in the glory of their achievements. To the contrary – at Watches and Wonders in Hong Kong the Grande Maison once again demonstrated the ascendency and relentlessness of their technical and creative output, with the debut of the Rendez-Vous Ivy Minute Repeater. Those familiar with the Rendez-Vous collection know of course that it has provided a genuine feminine expression for many of the foremost technical mechanisms in watchmaking – showcasing previously the tourbillon, celestial indication, and perpetual calendar. 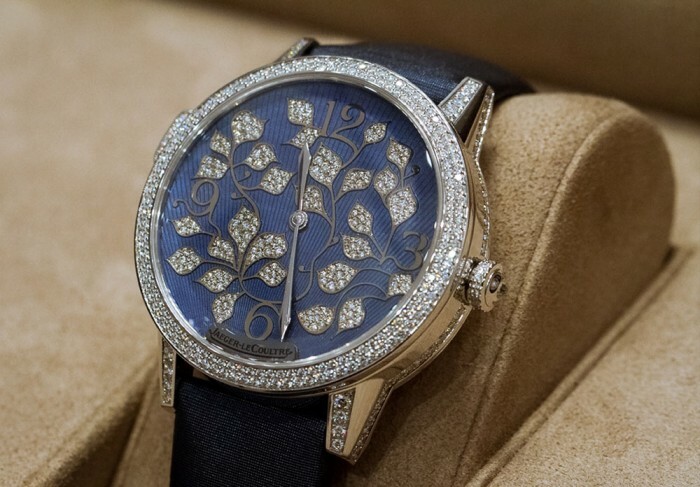 Jaeger-LeCoultre have now added perhaps the most significant chapter yet in the history of the Rendez-Vous, with company’s very first ladies minute repeater. The most impressive thing about the Rendez-Vous Ivy Minute Repeater is the strength of its technical execution. We are somewhat used to, and quite honestly expect ladies watches to be aesthetically alluring, and while there is definitely no shortage of knee-weakening seduction here, it is the unmistakable presence of innovative technologies and techniques that deserves the greatest praise. To start with, the watch features a brand new specially designed calibre – the automatic 942A, which boasts a respectable 43-hour power reserve. For the repeating function, Jaeger-LeCoultre’s patented trebuchet hammers are fitted, which powerfully strike gongs connected to the sapphire crystal at the front of the watch. Not only do these ‘crystal gongs’ allow the sound of the strike to be transmitted with rare volume, they also mean that the watch’s case can be fully sealed, and therefore water resistant to 30m. Furthermore, the activation of the repeater itself is achieved via a brilliant new mechanism, whereby rather than pushing a traditional slide, there is a button that must be depressed inward to wind the repeater-mainspring. I had the pleasure of comparing the tone of the chime side by side with three different Jaeger-LeCoultre mens minute repeaters, and whilst the overall volume was slightly lower (owing mainly to the watch’s smaller case) the ‘Ivy’ did have a gorgeously unique feminine quality, and resonated sweetly and clearly. It remains however quite a challenge to ignore the aforementioned aesthetic for long, and it is here that the Rendez-Vous Ivy Minute Repeater exhibits in full resplendence the long developed capability of Jaeger-LeCoultre in artistic presentation. The dial’s design is as refreshing as it is familiar, never breaking from the tradition of the manufacture nor the trajectory of its future. 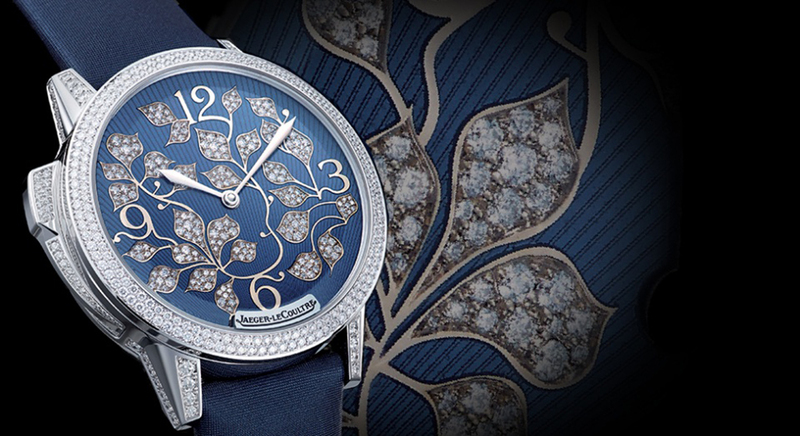 The ivy design motif on the dial, which evidently gives the watch its name, is completed through the snow-setting of no less than 255 diamonds, with a further 293 tracing the lines of the bezel, crown and lugs. The ivy pattern also seamlessly incorporates the numerals at 12, 3, 6, and 9’oclock, and is set against the stunning blue of grand feu enamel, which has been applied over guillochéd white gold. Topped with clearly identifiable and yet still gracefully floral hands, the Rendez-Vous Ivy Minute Repeater entices, apprehends and utterly consumes attentions not unlike the natural phenomenon of ivy overtaking a structure. In fact at the presentation of this new masterpiece at Watches and Wonders, which began with what is perhaps the most gorgeous film of a watch being constructed that my eyes have ever seen, Editor of Revolution Australia, Adi Soon, turned to me and quite seriously proclaimed: “I want it… this watch is for men too right?” Such is the irony – that although for year upon year ladies were forced to look on jealously as yet another brilliant new complicated men’s watch was presented, at the exact moment that such an innovation-packed ladies watch was debuted, all men became instantly envious. But really who could criticise a man for wearing such a consummate watch? And if by chance there were a scoffer quick to shout unpleasantries, I would recommend pressing the button on the left-hand side of the case, and forgetting everything else but the sound of perfection. That is of course, if you can ever separate it from the wrist of your leading lady. The Rendez-Vous Ivy Minute Repeater comes in a 39mm, white gold case, and will be limited to 88 pieces.